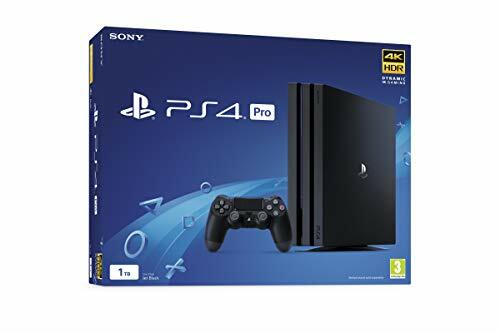 PS4 Pro The Super-Charged PS4 The Worlds Most Powerful ConsoleMost powerful means when compared to other consoles on the market on 10.11.2016. Compatible 4K HDR TV required for 4K and HDR support. Dynamic 4K gaming outputted by graphic rendering or upscaled to 4K resolution; support varies by game title. 4K entertainment via 4K video streaming services only. HDR and faster frame rates not supported by all games and video content. Best Selling is based on UK sales of all consoles 02/01/14 to 05/11/16.Works with: DUALSHOCK 4 wireless controller combining revolutionary features with intuitive design and precise controls, the DUALSHOCK 4 wireless controller defines the new generation of play. The new model features a stylish black matt finish, and shows your light bar colour from above as you play. PlayStation VR put yourself at the centre of the game and explore extraordinary worlds in a way youve never experienced before. For total immersion, interact with virtual environments using a PlayStationMove motion controller or DUALSHOCK 4 wireless controller. PlayStation Camera integral to the PlayStation VR experience, the camera tracks the PS VR headset, PlayStation Move or DUALSHOCK 4 wireless controller to heighten your sense of presence. It also unlocks PS4 features like voice controls, facial recognition and picture-in-picture video editing and broadcasting.